Rice is the most widely consumed staple food in the world. Today, this unique grain helps sustain over 3.5 billion people worldwide (i.e. half of the world’s population). Mewah ventured into the rice business with a clear vision to offer a new value proposition to our customers and business partners. We share our expertise in rice and work on a model which allows our customers to buy the right product at the right price within the right timeframes. More..
We map our crop buying from pre-identified locations, process it and pack it in our brand. The products are produced and packed in state-of-the-art, food safety management systems (ISO 22000) certified rice milling, sorting, grading and packing facilities at par with International Standards of rice processing. We undertake stringent and exhaustive quality tests from procurement to the dispatch of the finished product. These tests are conducted by our team of highly qualified and experienced in-house technical experts. With subsidiaries in Thailand and India, and representatives in Myanmar, Pakistan and Vietnam, we are able to source for the best quality rice. More..
We are currently exporting rice to more than 20 countries with our own distribution companies in Nigeria, Ivory Coast, Benin, Cameroon and Ghana. We are looking forward to developing long-term relationships with serious distribution partners for supplying Basmati/ non-Basmati Rice. 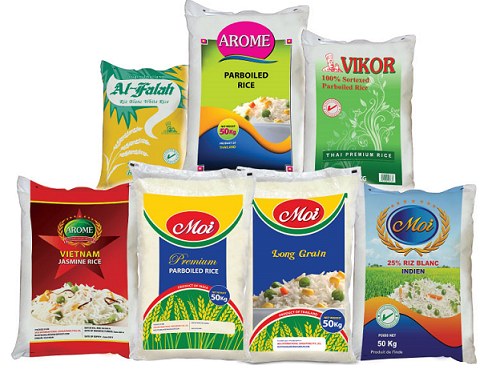 We offer rice in consumer packs of 1kg, 5kg and bulk packs of 10kg, 25kg, 40kg & 50kg in PP, BOPP, LLDPE, Metalised Film, Jute Bags, Non-Woven Bags.